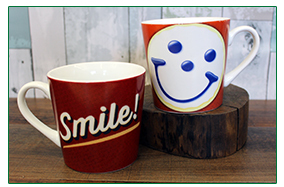 It’s going to be a summer full of smiles and we’re smiling about our new Smiley Merchandise! Read on to learn more about our new goods! 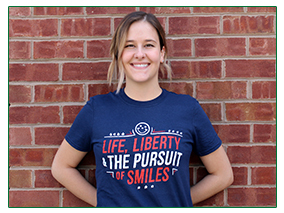 We’re showing off the red, white, and blue with our new adult Patriotic Smiley T-Shirts. They’re perfect for watching fireworks on July 4th, cheering on Team USA in August, wearing to the polls in November, and everyday in between! Pick up one today for only $9.99. 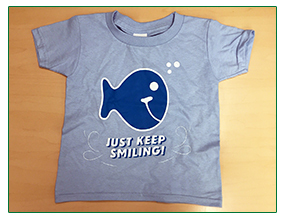 Kids are going to get “hooked” on our new Smiley Fish T-Shirts! For only $7.99, you can swim away with this great buy and watch your kids “Just Keep Smiling” all summer long. 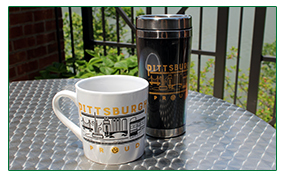 Whether you’re a Penguins, Pirates, and Steelers fan or just a fan of the Pittsburgh skyline, our new Pittsburgh Proud mugs are the perfect way to showcase your Steel City pride! Starting June 11th, choose from traditional ceramic for only $6.99 or take it on the go with our travel style for $8.99! *These mugs are available everywhere starting June 11th EXCEPT Boardman, Willoughby, Parma, Steubenville, Morgantown, Erie (Peach Street), Erie (12th Street), Clarksburg, Weirton, Chapel Hill, Warren, Medina, St. Clairsville, Mentor, Triadelphia, Austintown.